We’re on a Mission to find more Huskies! NIU alumni are a great student referral source. Maybe you were referred by someone you know. Help us grow NIU’s enrollment by referring a future Huskie. If your referral applies, his or her $40 application fee will be waived. 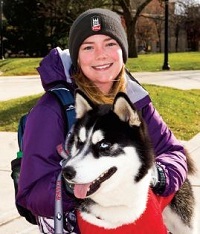 Children of NIU alumni are eligible for a Huskie Legacy Award, which provides $1,000 toward tuition for the first year. Please share this with the student if a parent graduated from NIU.